As we settle into the new year, forecasters at Oxford Economics are optimistic about America’s prospects in 2019. Despite a global slowdown in GDP growth, the US will post the strongest gains of any G7 country. Unemployment is at a 50-year low, and real wages are on the rise. 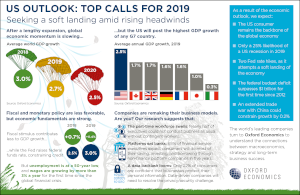 Yet with a rising federal funds rate, a dissipating fiscal stimulus and the risk of a renewed government shutdown—not to mention issues abroad, such as a no-deal Brexit and a trade war with China—companies will need to navigate some headwinds.